Jerry, a guy from somewhere in Britain? Or Karina, from somewhere in Russia? According to research1,2, British people are among the worst communicators in English! That’s because, although they know more words and phrases in English, British people are terrible (statistically speaking) at the strategies that help communication. These strategies include things like saying something in a different way when the other person doesn’t understand. Or checking with the other person that they’ve understood in the first place. They don’t simplify their language when talking to people from other countries. They often use idiomatic words and phrases — the same words and phrases that they use with their friends and family. Well, when that strange British person at work is talking to you with those strange words and phrases, don’t panic! If you don’t know the phrases, try to guess the meaning from context — that’s an important skill to have. But it also helps to have some phrases in your pocket, right? So here we are — 5 common British English phrases for stressful situations. This phrase has quite a large range of meanings. Like if your neighbour’s started singing pop songs to the tune of Beethoven’s fifth symphony, wearing a flower pot on her head and painting massive pictures of cats on her wall. Then, yeah — she’s crazy. She’s lost the plot. Or we can use it when our boss starts asking us to do ridiculous and pointless things — a familiar situation, right? Like when the boss sends out a memo telling all employees to sign their emails with “yours sincerely and most humbly and obediently.” Which is pretty random. You could say he’s lost the plot. OK. So let’s say you’re travelling by bus across Kazakhstan. Because that’s exactly the sort of thing you’d do, right? Maybe not your best idea. You’re going to the Caspian Sea, where you’re meeting a friend for a four-day wedding — yep! Exactly the kind of thing you do, isn’t it? You need to meet your friend in a couple of days, but that’s OK, because you’ve only got a few hundred miles left of the trip. You’ll be fine! Then the bus breaks down in the middle of nowhere. Now the plan’s kind of messed up, right? You can say that the bus breaking down really threw a spanner in the works. Definitely not your best idea. We use it to describe something that ruins or causes problems to a plan. To be fair, the example I used was fairly extreme. You can actually use this phrase for all sorts of other situations. Like when you were planning on having a picnic with your best friend, Karen. Then it starts raining, which throws a spanner in the works. Or when you want to leave work early because the boss is out. You’re just about to leave when he comes back unexpectedly — throwing a spanner in the works. DERRICK: OK. The film starts at 8, so let’s meet at about 7? JENNIE: Sorry, I’ve got to work late — I don’t finish till 8:30. DERRICK: Damn! That’s a spanner in the works. Bad news. I’m afraid we’ve got a bit of a spanner in the works. The computer system’s down. Again. You can use this phrase in two different ways. There’s the nice way and the not-so-nice way. You’re bowling with your friend, and she scores a strike. It’s the first time she’s been bowling, and she wasn’t very confident, so you want to show her your support and encourage her. But hang on a second, isn’t this a post about phrases for stressful situations? Well, that brings me round to the not-so-nice way of using this phrase. You can use the phrase sarcastically. It’s quite common. But I would advise against using it this way as it can be pretty aggressive and, well, not very nice. Basically, Tony is not a nice guy. One day you’re hanging out with Tony (not by choice, of course). Because Tony’s pretty lazy, you’re the one getting the coffee from the bar. You bring it over, but you spill your coffee all over the table. This has the opposite effect of encouraging your friend while she was bowling. It makes you feel worse and less confident. It’s the same phrase, but the situation means that the phrase is sarcastic and negative. It also means that Tony’s a jerk, and you shouldn’t hang out with him. Go hang out with Freya instead. Have you ever had to deal with a particularly difficult piece of bureaucracy? Like getting a residence permit, or trying to get permission to add that beautiful banana-shaped tower to your house? The most extreme example I’ve experienced was getting a residence permit (in a country I won’t mention) about 10 years ago. To get the permit, you have to go to a massive building full of people. There’s no queuing system (a British nightmare), and no one speaks English (another British nightmare). You have to push through massive families of 10 or more people to finally get to a small window with a very stressed cop behind it. Then he tells you that you’re in the wrong place. You need to go to another office. On the other side of town, of course. It’s empty and no one’s there. You find a cleaner and find out that they take a 3-hour lunch break on Thursdays. When they finally open again, they tell you to go back to the first building you went to. You’ve wasted all this time for nothing, just because they don’t really know what they’re doing. These guys have seriously been messing you around, right? So, as you can see above, you can use this when someone makes you do all sorts of things unnecessarily — when there was probably an easier way. But it also has another, slightly different meaning. We use this when we think someone is lying to us and trying to convince us to believe their lies. Like if your kids try to explain why they weren’t at school by telling you that they were kidnapped by a giant polar bear who really wanted to show them his collection of small spoons. I mean — that is awesome lying right there. Although if they were my kids, I’d at least congratulate them on their imagination. When something annoys you or confuses you, you can say that it does your head in. OK. We kind of have the two situations — being annoyed and being confused. Like when you have to listen to the same stupid song that they’re always playing on the radio. It’s so annoying! Why do they always play it? Everywhere you go it’s there — at the mall, in your favourite cafe, in cars as they drive past you. Or when your kids are running around, screaming and generally going nuts, because you accidentally gave them too much sugar. Calm down — you’re doing my head in! You can also use it when you’re trying to understand a really complex thought — but … just … can’t. The way the planets move around the sun does my head in. I mean — think about it. They’re all moving around the sun — OK. No problem there. But they’re also moving at different speeds. Can you picture that? OK. That’s fine, too. But they’re also moving around the sun at different angles, too. Can you picture that? Getting tricky now, right? They’re also spinning at different speeds and angles and all the moons they have are also going around them at the same time. I don’t know about you, but that just does my head in. I just can’t picture it. 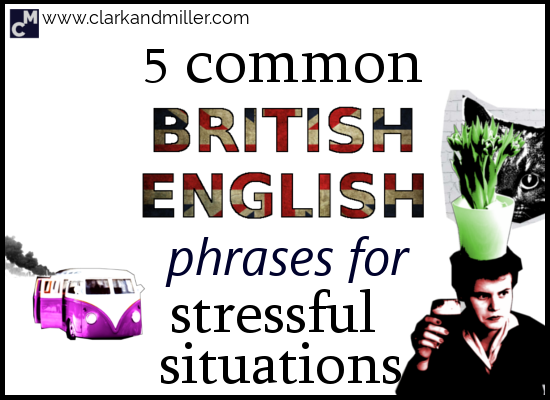 So there we have it — 5 common British English phrases for stressful situations. Nice one Good work! I’m impressed! Don’t mess me around Don't cause problems for me (especially in an unfair way). It does my head in It annoys or confuses me. If you missed it, don’t forget to check out last week’s British English words post. Did you find this useful? Do you know any people (or monkeys) that might also benefit from this? Then BE AWESOME and click the “share” button below! Spread the knowledge! Meanwhile, what are your favourite British English phrases? Did I miss any good ones? Let me know in the comments. Are you an English teacher? I’d love to hear from you! Click here. English as a lingua franca. Language teaching, 44(3), 281-315. ⟵Do You Know These 5 Common British English Words? Hello ! I would love to know who is more crazy: CLARK or MILLER? However, your way of teaching English is very fun. Thanks to both of you. So, what about “the way that cookie crumbles”? What does it mean? First of all — Thanks for the lovely feedback. I really appreciate it.